Telecom Regulatory Authority of India (TRAI) has released the latest telecom subscription data as on 31st March 2015. As per this report, the number of broadband subscribers increased from 97.37 Million at the end of February 2015 to 99.20 million at the end of March 2015 with monthly growth rate of 1.88%. State run PSU, Bharat Sanchar Nigam Limited (BSNL) was pushed to third position in Broadband segment (Wired + Wireless) with a market share of 19.03%. Airtel holds the No.1 position with 22.19% market share and Vodafone at second position with 19.53% market share as on 31st March 2015. 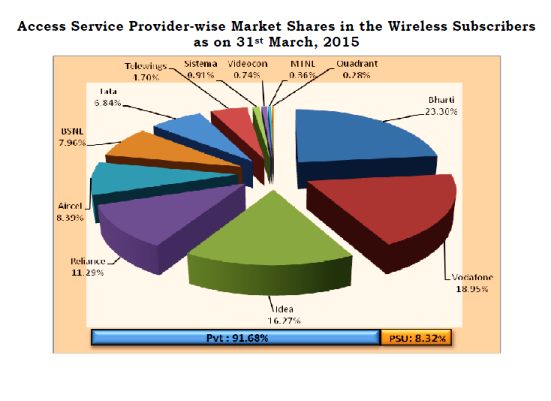 Top five service providers constituted 83.39% market share of total broadband subscribers at the end of March 2015. These service providers were Bharti Airtel (22.01 million), Vodafone (19.37 million), BSNL (18.88 million), Idea Cellular Ltd (14.52 million) and Reliance Communications Group (7.94 million). The total number of telephone subscribers in India increased from 987.30 million at the end of February 2015 to 996.49 million at the end of March 2015, thereby showing a monthly growth rate of 0.93%. Total wireless subscriber base increased from 960.58 million at the end of February 2015 to 960.89 million at the end of February 2015, thereby registering a monthly growth rate of 0.97%. 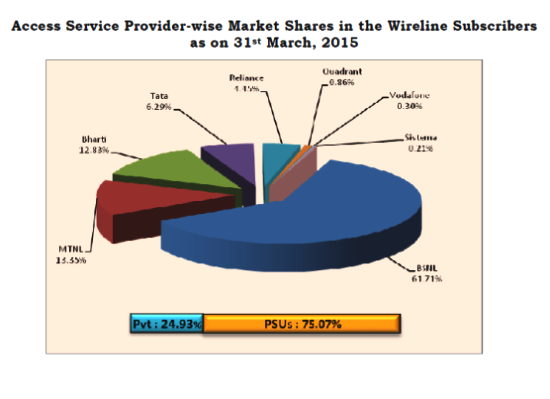 As on 31st March, 2015, the private access service providers held 91.68% market share of the wireless subscribers whereas BSNL and MTNL, the two PSUs access service providers, held only 8.32% market share. BSNL maintained the No.1 postion in the Wireline (Landline) segment with a market share of 61.71%. 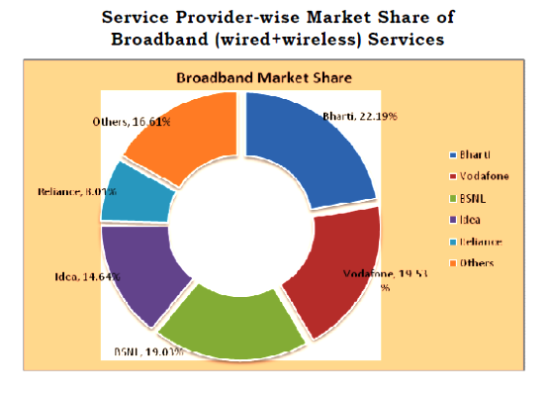 In Wired Broadband segment, BSNL holds the No.1 position with 9.96 million customers. In wireless broadband segment, Bharati Airtel holds the No.1 position with 20.58 million customers.